Although we enjoyed our time at Brownlow, Kingscote, it was good to get out of the main town and head for Stokes Bay, on the North Coast. The fees at Brownlow were $32 and the park was extremely old. 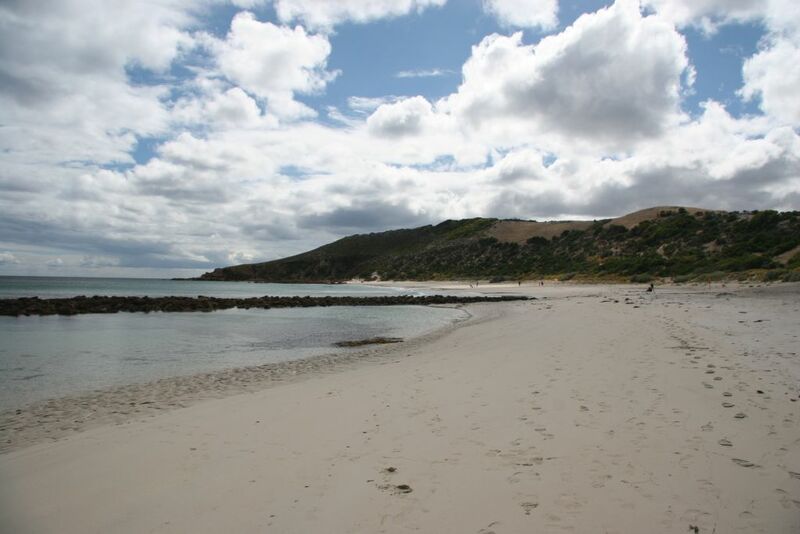 Firstly, we called in at Emu Bay, thinking that we may stay a night there, but maybe in 20 years time, when all the trees have grown around the newly erected camp ground, now it is just a bare piece of gravel. When they build something here, they really build it to last and the shelters are roomy, usually with two large tables and a BBQ (free) and sides on the shelters to give protection from the wind. Continued to Stokes Bay, where the campground is privately owned. $5 per person (Council parks $5 per vehicle). 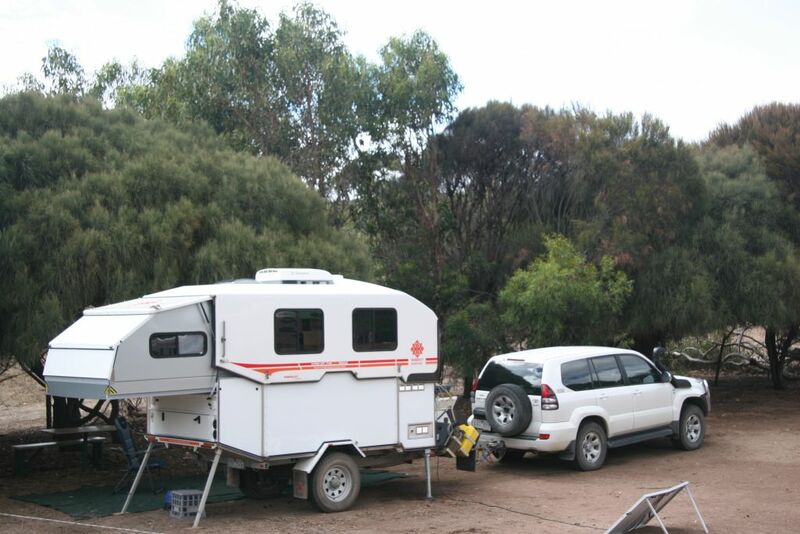 Found a lovely site, snuggled amongst a stand of casuarinas, with a Koala in a nearby eucalypt, a tiny Tammar wallaby, (who followed us everywhere) and we are looking forward to our two nights here. 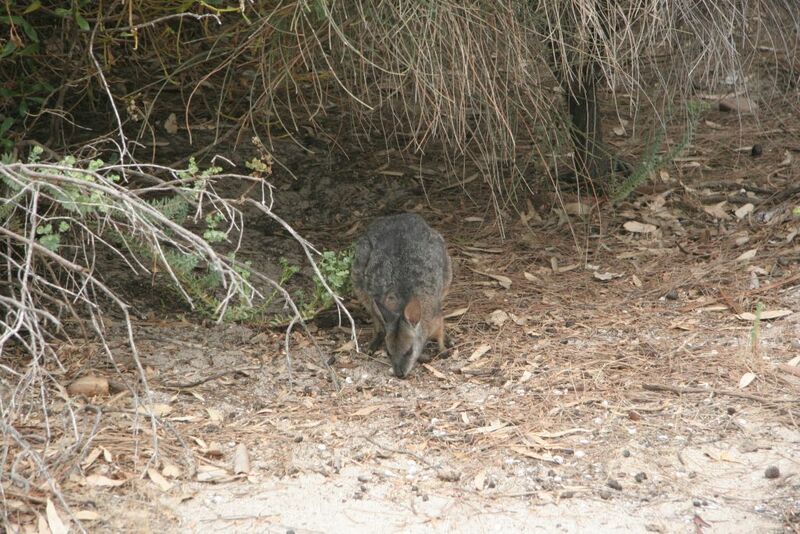 We had a couple of kangaroos sleeping under our caravan on the first night, giving Russ a fright as he went to have a pee, and a bandicoot under it the second night, sipping water from a drip from a leak in the back of the van. The weather has been cool, to say the least, with a cold wind, and rain, fortunately mostly at night. A few showers during the day, but not enough to stop activities. There is a small walk to the BBQ shelter and the bay, but it is one of the best areas we have seen so far. 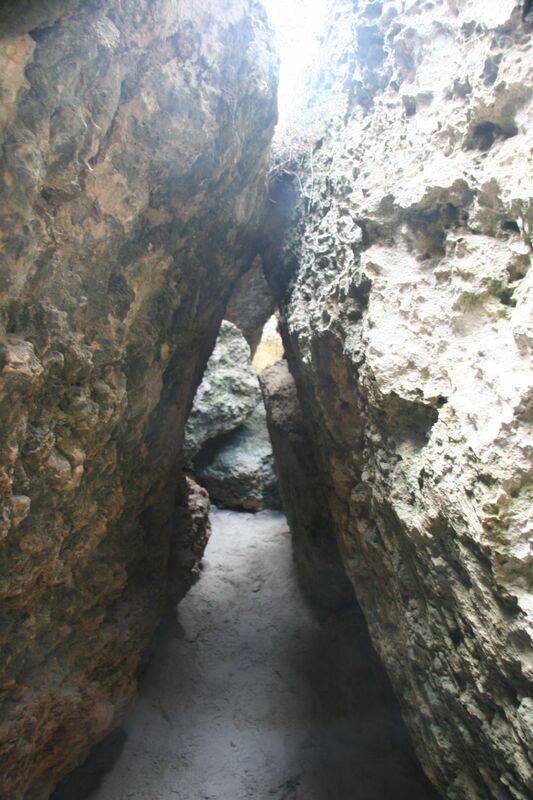 We followed the signs to the beach, through limestone cliffs, winding our way through the narrow path and at times, having to crouch down to enable us to get our heads through. There was plenty of light and it was quite exciting. On the other end through the cliffs was the beautiful beach of Stokes Bay. A very excited Asian visitor came rushing through the cliffs, shouting out for his wife, so he could show her that he was holding a good sized cray. Someone had given it to him – I guess we were in the wrong place at the wrong time! We lunched at the Rockpool! No not that Rockpool, but the Rockpool Cafe. A tiny cafe at the camp ground and had delicious fish, chips and salad. The second day we sat around and did cryptic crosswords for most of the morning, but the weather was freezing. Decided at about 5pm to go to the shelter by the beach and have a BBQ and stayed there for at least 3 hours, enjoying each other’s company and the beautiful view. Arrived in the Western End of KI today and have booked into Western KI Park for 7 days. $25 Conc. per night (last night free if you book in for a week). 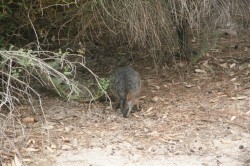 We have another couple of koalas opposite our camp and went on “A Koala Walk”, but didn’t see any. That doesn’t mean that they weren’t there though! More information as the week goes on. 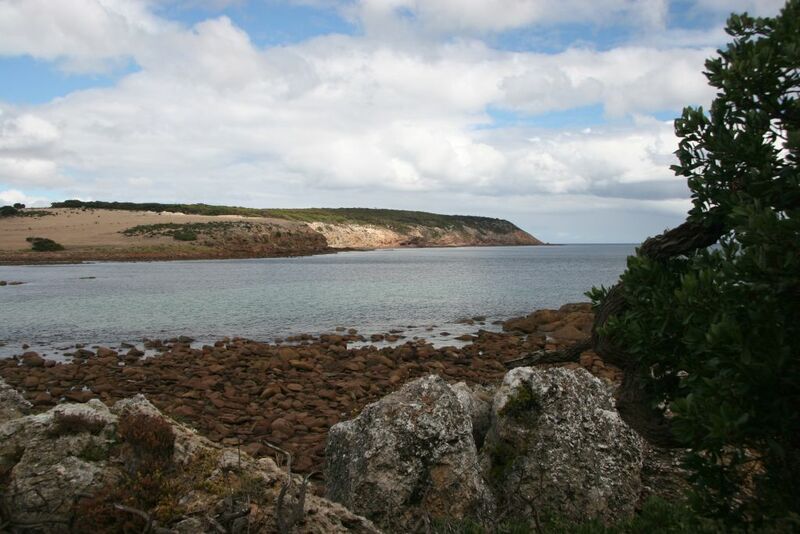 It is a surprise to have reception over here, so we’ll be able to give you our impressions of Flinders Chase National Park, The Marron Cafe, Kelly Hill Caves and Vivionne Bay.